The new galleries opened this weekend. 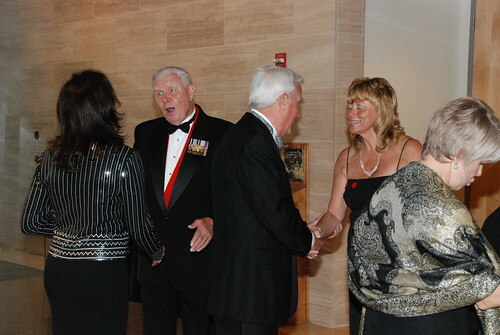 The kick-off was the formal gala Friday evening. 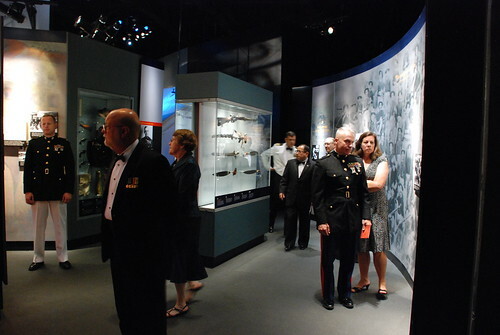 Above, General Ron Christmas, President of the Marine Corps Heritage Foundation and Lin Ezell, the Director of the museum, greet guests as they enter. 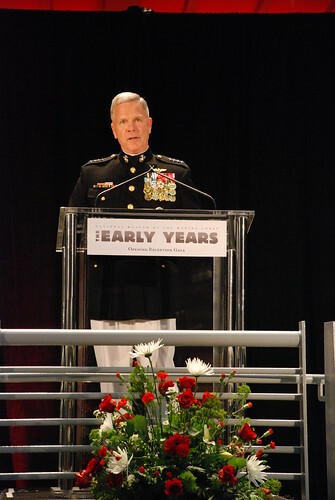 The keynote speaker was General Amos, the Assistant Commadant of the Marine Corps. 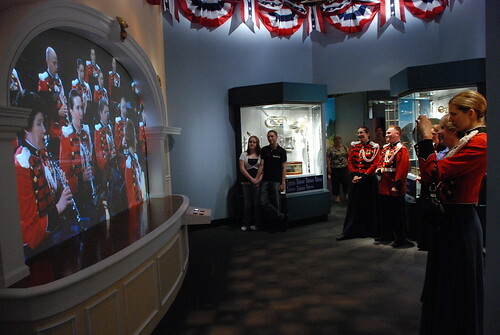 Prior to and after the ceremony and buffet dinner, guests got to check out the new galleries and re-visit the old. 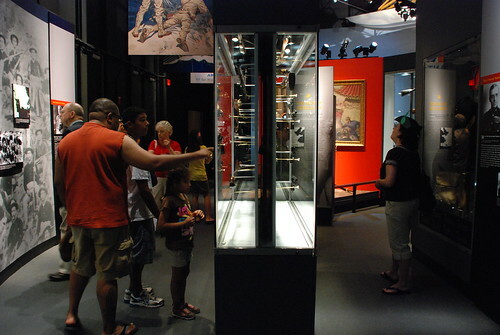 The tableau at the entrance of the World War I gallery depicting a German machine gunner and a US Marine locked in mortal, hand-to-hand combat, made its return. It had been part of the original opening of the museum, kind of marking the spot where the WW I gallery would be. However, it was removed from its glass case. Anything that could possibly be touched is a replica. However, that replica knife looks pretty deadly. The Chief of Exhibits told us that someone would have to really work to get that weapon, as well as the pistol the German is holding. Arms would have to be broken off the statues to get the weapons and of course someone would have to climb onto the tableau and then avoid the security cameras. 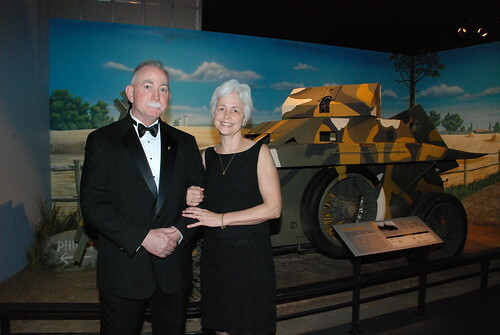 Below is Skip, one of the volunteers in the Restoration Division and his wife. Skip and I worked together when I was also a volunteer in restoration. They are standing infront of the King Armor car, a vehicle the Marines tested but did not field. 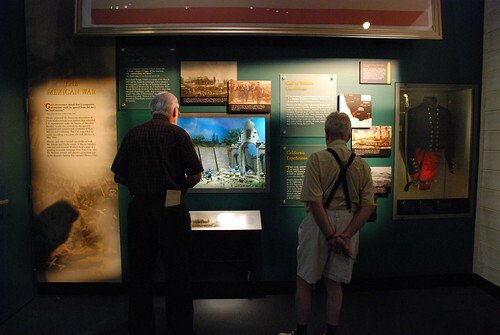 In this same gallery, visitors examine many other artifacts from the early 1900s. 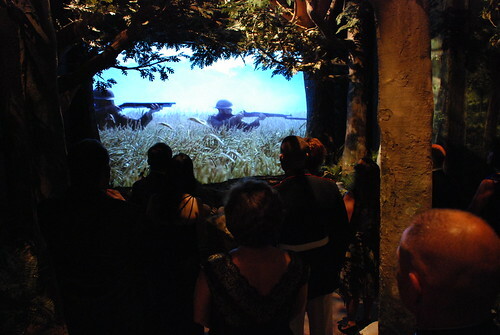 The much anticipated gallery was the Belleau Wood immersion. Below, visitors sit among the trees behind a German machine gun position as Marines charge through the wheat fields toward them. Lying in the machine gun pit before them are the bodies of two dead German soldiers...which honestly, you don't really notice. The film is awesome. It was filmed last summer in a wheat field in Bealton, Virginia. Most of the actors were Marines stationed at Quantico with a smattering of professional actors. 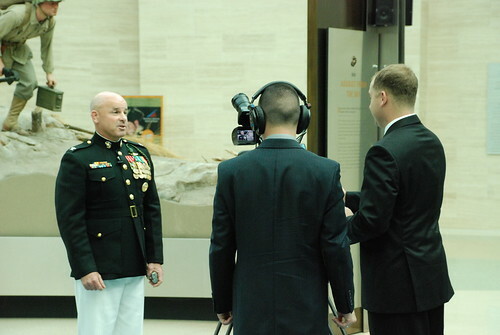 During production, directors found that the real Marines, with no acting experience, were doing a better job playing the part of Marines than the actors. All of the Marines in this film had seen combat in Iraq or Afghanistan, so even though the uniforms and weapons were reproductions of those and used almost 100 years ago, there are somethings that are no different today than they were then. 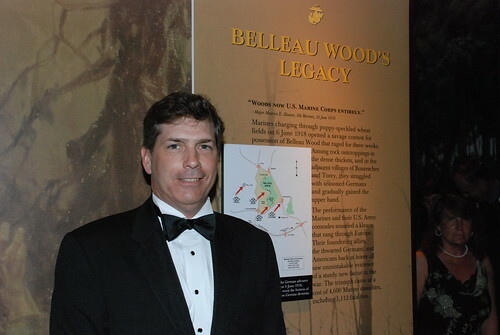 This gentleman is the great-grandson of Major Maurice E. Shearer, 5th Marines, who on June 26th cabled, "Woods now U.S. Marine Corps Entirely." The younger Mr. Shearer had been in the Marine Corps back in the 1980s. What a legacy to carry on. He had just returned from France and Memorial Day celebrations there in the Wood, the previous weekend. 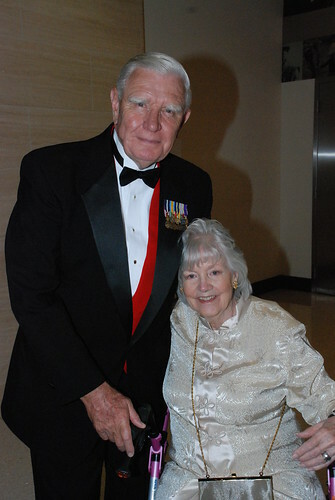 Below, General Ron Christmas with Mrs. Madonna DeGrasse. Her late husband had been one of the first Marine Corps combat artists during World War II. He was later the Art Director for Leatherneck Magazine. One of his paintings is hanging in the entrance of the Revolution through Civil War gallery. BTW, General Christmas is a Navy Cross recipient for action in the battle of Hue City during the 1968 Tet Offensive. On Saturday, things were a bit chaotic. 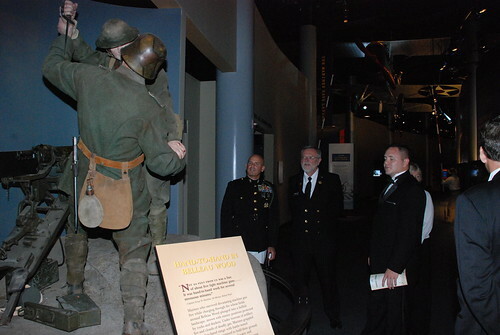 There were about 25 docents as well as Marines from the 5th Division here to commemorate the opening of the new galleries, especially that of the Belleau Wood/World War I gallery (today, June 6th is the 92nd anniversary of the Battle of Belleau Wood). 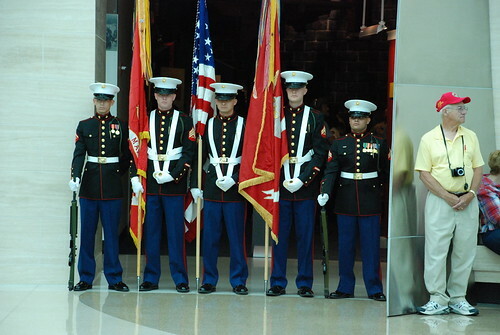 Below is the color guard from 5th Marines. Many of our visitors on Saturday didn't know this was going to be the grand opening of the new galleries. It was quite a thrill for people to be part of the ceremony and then to see these new galleries. The big complaint we had heard before from visitors was they had not planned enough time to see everything. We'll be getting more of those complaints now that we have these three new galleries. 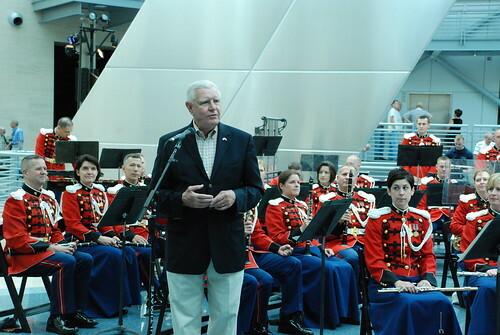 In addition to the 5th Marines helping us dedicate the new galleries, the President's Own, the Marine Corps Band, is also featured in the new galleries. They performed in Leatherneck for our visitors, what a great concert it was! Below, I caught the Marine Corps Band taking pictures of...the Marine Corps Band. 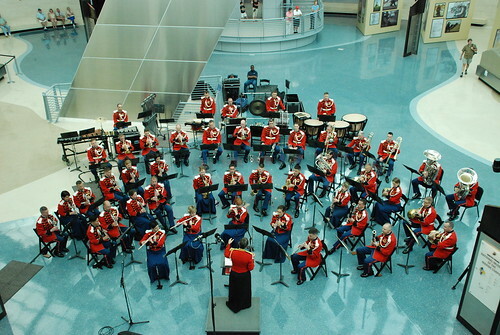 General Christmas introducing the Marine Corps Band to museum visitors. What a great concert! 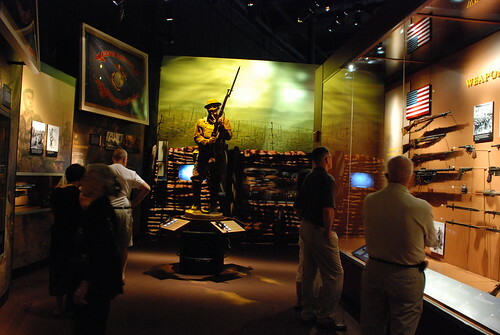 One day I HOPE to be able to spend all the time I want to when I get the chance to visit the Corps' Museum. For an old civilian it is more than a dream because it's now near the top of my "things to do before I die" list. I think you have a lot more years before you kick the bucket...and if you accomplish the bucket list early...just make a new list. When you visit, seriously, plan a whole day. When I'm finially able to visit I hope to be able to spend a whole week there not only looking and reading but talking to any and all who will answer the usual and maybe a few "silly" questions from an old "Wanted to be" but due to asthma "could not be".